A deeply orange wine from an outstanding producer of organic wines in Thessaloniki region. 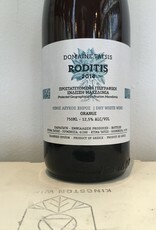 Full-bodied and tannic, this example of Roditis is dramatically different than the typical young white wine it makes. Melons, dried apricots, oolong tea, this is a complex wine capable of gracefully aging further. Organic farming, wild ferments, little to no sulfur additions. When the Tatsis family was moved to Greece they chose to settle in Goumenissa, an area (and appellation) that was covered in vine and spoke to their values and history. The fit was natural and the Tatsis brothers forbearer’s property started with a scant 4 hectares that has now grown into 14 with additions that they’ve made since taking over the domaine from their father with their first vintage in 1996. Periklis works the land and oversees the vines with Stergios in charge of making the wine although the lines often blur with a family endeavor. The wines are certified organic with many biodynamic principals applied but the best way to describe them is as one of the small group of original natural winemakers in Greece to pop up in the 1990s, numbering no more than 3 or 4 at most at a time when international varieties, commercial yeasts and 100% new oak was the norm in the rest of the country.